Designed specifically for PlaneWave CDK700. Reduces the focal ratio to F/4.5 . The PlaneWave 0.7x reducer is designed specifically to be used with the PlaneWave CDK700 telescope. The reducer lens reduces the f-ratio of the CDK700 telescope by 70% to give an effective focal length of 3150mm and an f-ratio of F/4.5. The reducer attaches to the CDK700's Nasmyth focus port and has mounting holes for attaching to the PlaneWave IRF90 rotating focuser. The reducer lens has 75mm/3" of back focus from the mounting surface of the IRF90. 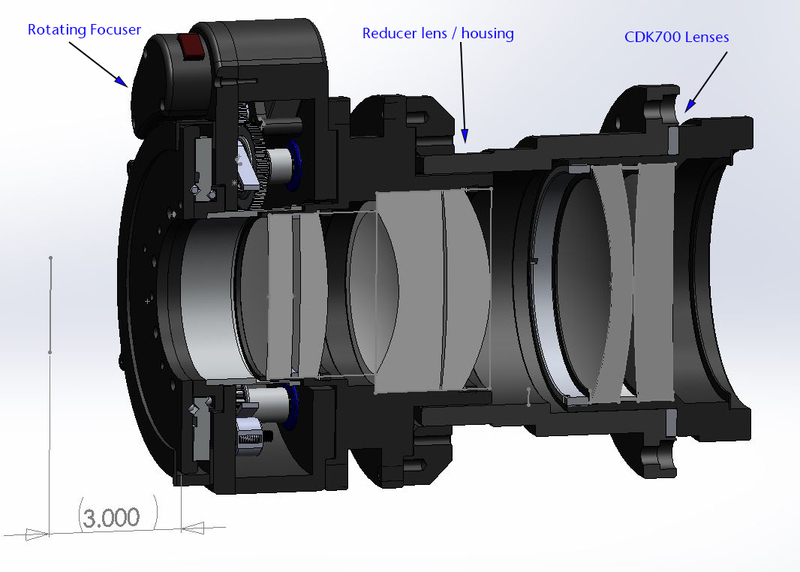 Below is a cut-away diagram of the reducer lens attached to the IRF90 rotating focuser. Please note: The use of the IRF90 with the reducer lens requires replacement of the threaded internal baffle (ROF 307). The baffle comes as standard with reducer lens. The image below shows the optical performance of the CDK700 with and without the 0.7x reducer lens. 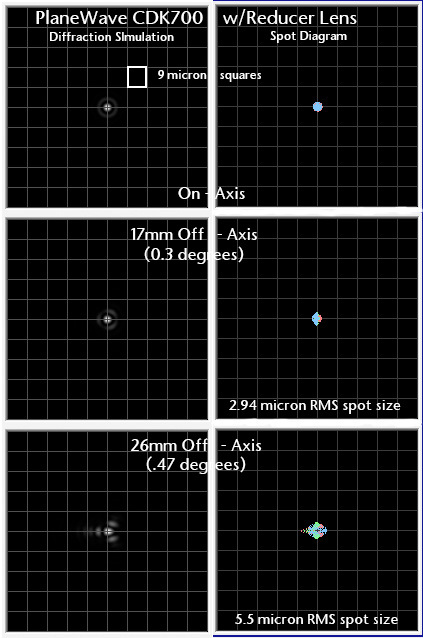 It shows that the spot size is 5.5 microns RMS at the edge of a 52mm imaging sensor.